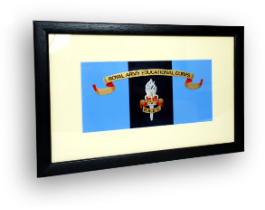 Our Framed Emblazons provide a perfect commemorative gift. All framed emblazons come with a cream mount, perspex front and a black painted frame. Our replica Ice Buckets are the perfect gift for service men and women. Each is replicated faithfully with the correct appointed bands and ropes. Our March Cards are available in a number of different finishes and come complete with choice of lyre widths. The perfect finishing touch to any marching band. Bespoke melamine table mats made with 4.8mm board, green felt backing and with a choice of finishes and sizes. ...the home of the original Replica Drum Ice Bucket. 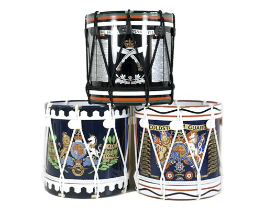 Designed and still produced in South West England since the 1960's for the Armed Forces, corporates, football clubs and private commissions. 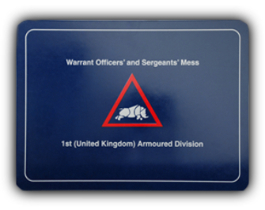 With our emphasis on high quality products we also supply; framed emblazons, bespoke melamine table mats, march cards for military (under a MOD contract) and civilian marching bands, regimental and corporate plaques. 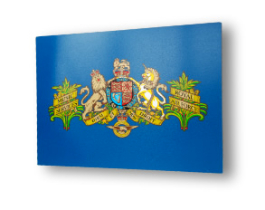 We hold a valid CROWN COPYRIGHT licence to reproduce all current insignia for the Armed Forces.